The Wood Duck is a North American species of duck closely related to the striking Mandarin Duck whose numbers are on a decline in their native Eastern Asia. 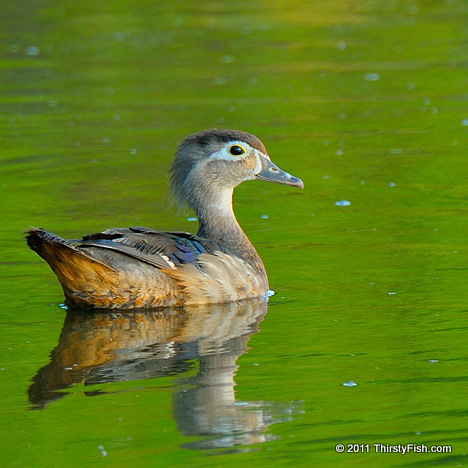 Some people use "Duck" to refer to adult females exclusively and "Drake" to denote adult males. The drakes of many Northern species have bright, extravagant colors during breeding season, while ducks tend to be drab - probably to camouflage them while they incubate their eggs. In Old English, the pastime of skipping rocks over water was called "playing ducks and drakes". The expression has come to mean, "to behave recklessly; to idly squander one's wealth".